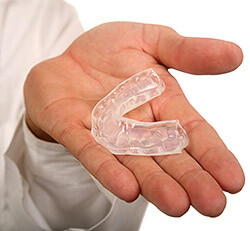 A night guard is a dental appliance that is designed to create a barrier between the top and bottom sets of teeth, preventing bruxism and discomfort associated with TMD. If you suspect that you have a joint disorder or might be grinding or clenching your teeth while you sleep, talk to Dr. Straka about how a night guard might help you. He will make an impression of your teeth and have a customized dental night guard created for you.